I am a side sleeper and it is a very comfortable pillow. Adjusts well to my neck and shoulders. Has a slight oder when you first receive it but it does go away. I suggest airing it out for a day if it bothers you. 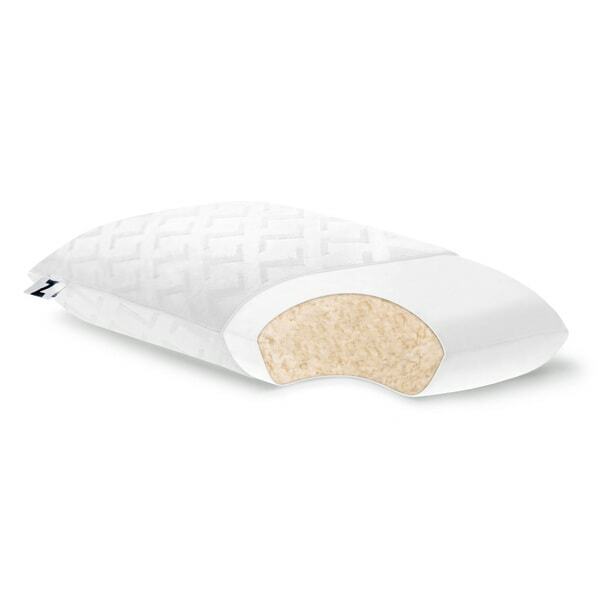 This comfortable pillow features latex foam derived from sustainable rubber trees. The milky sap tapped from these tropical trees is converted to a soft, resilient foam. The shredded latex pieces combine to offer a traditional pillow feel that is both resilient and comfortable. I really loved this pillow. When I first opened it up, I wasn't too sure, to be honest. It felt heavy. BUT, it wasn't at all. It gives your head just enough support but you feel like you are sinking into it and it's just the right amount of softness. I sleep with it every night. If I am on the couch, I make sure and bring this pillow out to lay around on. It will seem heavier than most other pillows, but it feels light as a feather when sleeping. I think it's hard to find just enough support in a pillow. This pillow has that. It conforms to you and now my husband and I fight over it. We will have to buy another one. Love this pillow. Love this Pillow! It has great support and holds it's shape really well! I love that after everyday use it still looks and feels like a new pillow. My head stays cool when asleep and I would recommend this to everyone. My only regret is not buying 2! This pillow has changed the sleeping game for me. No more needing to shift around and fluff my pillow in the night. My head hits the pillow and it is perfectly set for a great night sleep. This thing is so soft. It is seriously amazing! These are quite comfortable. I'm enjoying them. This is the best pillow I have ever slept on. I am finally getting a good nights sleep with no pains in the morning. It has a nice weight to it but not too heavy. Soft to medium. The fill is just right. There was &amp; is no odor &amp; does not flatten at all. If you need a good sleep this is the pillow to buy! nice and supportive. It is easy to fluff back into shape. The weight is a bit to get used to. but once you are lying down on it, the weight is not an issue. They did have some latex scent out of the box. So, we waited a couple of days to let them air out, before stuffing them into pillow cases & putting on the bed. There is no discernible scent now. I'm a happy camper. This was a real disappointment--I expected this pillow to be somewhat similar to other latex pillows I own, but it had none of the springiness or lift. This pillow was lumpy, heavy, dense, and too low. It was also expensive, and because of how heavy it is I had to pay too much out of pocket to return it. I do not recommend! "I'M LOOKING FOR AN ADJUSTABLE LOFT 100% LATEX PILLOW, PREFERABLY TALAY LATEX... I DO NOT WANT A PILLOW THAT HAS ANY AMOUNT OF MEMORY FOAM OR GEL INFUSION OR ANY OTHER ADDITIVES... I'M CONFUSED : IN THE DETAILS AND SPECS FOR THIS ITEM, I SEE GEL INFUSED MEMORY FOAM AND I SEE LATEX --- WHAT IS THE FILL TYPE ? AND DOES THE INNER CASING FOR THE FILL HAVE A ZIPPER TO ENABLE ADJUSTING THE LOFT ?" With the Shredded latex pillow the Fill is 100% Latex Foam Rubber, there is no zipper to adjust to loft of the pillow, it is a 7inch loft. I had one of these pillows many years ago, it was the best pillow I have ever had. I'm finding it harder to sleep as I get older and hope this will help me sleep better. Thank you overstock for having a variety to choose from.